Changes are a brewin’ in Nova Scotia. The province has made some amendments (what many landlords and renters consider to be overdue) to their landlord and tenant act that have taken effect November 15th. At first glance, our city seems like an ideal spot to rent an apartment in. The average rent for a two-bedroom apartment in 2011 was $925, compared with $1,237 in Vancouver and $1,149 in Toronto. And while other cities across Canada recently experienced slight decreases in their apartment vacancy rates, Halifax’s vacancy rates increased from 2.8 per cent in April 2011 to 3.2 per cent in April 2012—people haven’t been snatching up apartments as quickly as they did in years past, so renters presumably have a little more to choose from. The Residential Tenancies Program sees around 5,000 applications to the director each year—meaning around five per cent of tenant-landlord relationships require dispute/resolution services each year, according to Service Nova Scotia and Municipal Relations’ spokesperson Susan Mader-Zinck. And those are just the cases that make it through theboard program’s bureaucratic application process. CBC also published a story back in April of this year about groups of residents who were demanding better conditions on units they’ve been renting, and calling for a crackdown on bad landlords. Yikes. The first significant change is that renters will now have automatic tenure – or right to tenancy, which means landlords have to provide a reason to evict a resident, and there has to be a hearing. Fixed term leases are an exception to this. Prior to these changes, tenants didn’t have tenure until they’d been living in an apartment for five years – at which point they were considered a long-term tenant and were afforded more rights. In that five years, a landlord could opt not to renew a tenant without reason. Some landlords will view this as a negative implication in the act’s changes, as in effect, it makes evicting tenants who pose a problem more difficult. Another perspective on this is that landlords will be extra particular when choosing a candidate to sign a lease with. Another big change is that rent can only be 15 days late before the landlord can give a tenant notice that the lease will end. Tenants used to have 30 days under the old act. This is a positive change for landlords to be able to react at the RTP level. Another big change includes giving tenants on fixed-term leases the ability to end their leases early, without financial penalties, for health reasons. Landlords are now required to give a copy of the Residential Tenancies Act to tenants within 10 days of the lease being signed, the keys being provided, the stated date of move in on a lease, or the move in date itself. Some of these changes are efforts to address some of the concerns residents have about complaints to landlords resulting in a simple request to leave. Are you a landlord in Nova Scotia? What do you think of these changes? Share your stories and perspectives here. We’d love to hear them. What does a landlord in NS do when a tenant stops paying rent, breaks the terms of the lease agreement and refuses to leave the property? The tenant will not answer the door, phone or respond to email. Registered mail is only considered served when the addressee picks it up. Further to all of this, what are the landlord’s options if he/she feels that the appointed tenancies officer might not be capable of affording (the landlord) an impartial and objective decision? Thanks for your comment. This sounds like a difficult situation indeed. Why did the tenant stop paying the rent and cut communication off with you? Is there a reason why they think they can live in your unit for free and ignore you? In an effort to understand the whole situation, it’s important for me to ask those questions. I’ve personally had two situations myself where this has occurred, and they were both related to the tenant suddenly running into money problems (one lost his job and the other got divorced). Both took issue with my position that while I was sympathetic to the challenges they faced, they were still required to pay the rent. They both took that as me being unreasonable and unwilling to be flexible and blew that up into a bigger situation than it really was. I ended up going to the board for one of them and won a decision for eviction. Please fill me in a bit more – however – as far as your concern regarding the impartiality of the appointed tenancy officer, that’s another tricky situation. I’d probably recommend hiring a paralegal to get this mess sorted out. Did the tenancy officer do or say something in particular that is leading you to this belief? i know of a tenant that is evicted, was suppose to leave in feb and is still there. Can i call the police and have him removed. p.s not only was he suppose to leave, but i walked by his unit today and he was stealing the power out of the hallway. Thanks for your comment. Are you the landlord or another tenant in the building? When you say – stealing power…is it a “plugged a radio into a hallway outlet” kind of situation or is he re-routing electricity into his unit for something more serious? Question, I just found out that my landlord is charging me the power to run an empty unit next door to me. Makes me wonder if am paying for hers also. What should I do about this. I am moving at the end of the month breaking my lease but we came to agrement (due to health reasons) and my power bill being over $400 for 2 people, less than 500 sq feet for 2 months. Thanks for your comment. You’re clearly not renting an all inclusive. Is that right? You’re covering your own utility cost? How do you know your landlord is charging you for the power on an empty unit? If you could provide a few more details, that would be helpful. We just moved into the upper part of a duplex in April 2013. We have had one problem after another since we moved here. For 4 weeks now the septic is broken. It needs a new septic system and field. We were told to stop doing laundry, even though the downstairs neighbours are still doing theirs. The property manager doesn’t seem to give a hoot about it and keeps telling us “next week”. How long is considered reasonable to wait for the septic to be fixed? We have been taking our laundry to the laundry mat and are not being compensated for it. More excuses! Can we legally walk away from our lease if it isn’t fixed? Thanks for your comment. I’m assuming you’re in Nova Scotia. That’s quite a situation you’ve found yourself in. 4 weeks seems like a long time to wait for a septic system and field to be fixed. In an effort to understand the situation accurately, has the property manager explained why the required repair is taking as long as it is? Do they understand the inconvenience this is creating for you and/or the other tenants? What is the reason for the delay? A septic issue affects the reasonable enjoyment of the unit and hinders a relatively major element of occupancy. This is the thing….you’ve signed a lease for a year. Breaking that lease is going to be difficult unless you can prove that the landlord or property manager is breaching the conditions of the lease and not holding up their end of the bargain – which was to provide you with a functioning and habitable place to reside. My recommendation would be to contact the provincial government’s residential tenancy branch and ask them about filing an application. I would only recommend doing this if you’ve exhausted every reasonable avenue to get this resolved. Hi, thanks for your reply. Yes, we are in Nova Scotia. The actual Landlord is in Vancouver and he says, only speaks Mandarin. The communication is difficult, according to him. I understand things like this take time, but I am starting to feel that he is a bit of a slumlord. I have a tap that I asked to be fixed to no avail. Then we noticed a mold smell coming from my son’s room and asked him to look at it. He hasn’t. There is an old fridge and garbage under our deck, that we asked to be removed. He keeps telling us that HRM is coming out to take care of the Freon and then it can be put to the road. I think he expects us to do it. Seriously, I am at the end of my rope and so is my husband. We didn’t want to take it to the Tenancy Board, but it is looking like we have no choice. The lease my husband signed, looks like something I have never seen before. I think it may be a commercial lease. I asked him to get us a separate mail box and he told me that the owners would sell if there was any trouble. I guess asking for things to be fixed is making trouble. We have been living in the same apartment for over 2 years now and only signed a lease when we moved in. Can we move out anytime as long as we give 3 months notice or do we have to wait to give notice three months before our anniversary month of when we moved in? Thanks for your question. First order of business is determining what kind of tenancy you have. It sounds like a year to year. 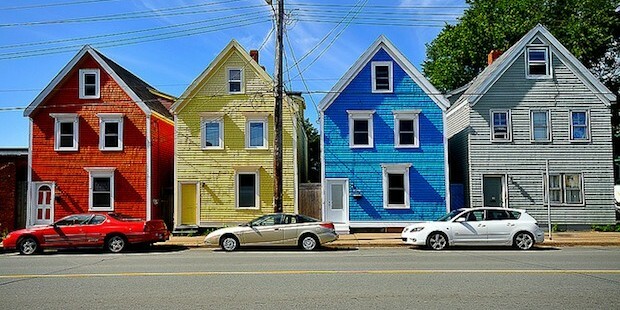 In Nova Scotia, Year-to-year leases renew for another year if no notice is given. Notice must be given three months in advance of the anniversary date. If tenants serve a Notice to Quit under their original lease 3 months before the end of its term, they may ask the landlord to change the tenancy to a month-to-month lease. Landlords cannot arbitrarily deny this request. My neighbour upstairs tub is gushing water into my bathroom,it is starting to cause mold and soaking the electrical wiring in the ceiling causing the circuit breaker to shut off and i also have to clean my bathroom every time they use the shower/tub,the landlord has know about this for over a year and has been reminded when I pay the rent every month,what can I do? Thanks for your comment. That’s definitely not right. What province are you in? I have been fortunate to have good landlords over the years except one time. My current landlord is trying to roll-in pre-authorized debit(PAD) because it is “easier for everyone”. Anyway, they are aware I won’t be signing up. Superintendent was supposed to speak to landlord and get back to me. So far, nothing. Sounds good to me. Now, what I like about these changes is it gives tenants tenure immediately and landlords have to provide a reason for a notice to quit. There is also language about what constitutes a reasonable request/change. What they are asking me to do with regards to PAD is like going to the bank and the teller says, they can’t accept $500 in your rolled-up coins because bills are “easier for everyone”. Cheques remain a legal method of payment, it’s the option on my lease, and convenience is not one of standards listed for a reasonable request/change. What I also find interesting is the lack of a notice to quit by a tenant for when a landlord is in breach of statutory conditions. There ought to be one. That said, it doesn’t prevent tenants from breaking a lease especially if they can demonstrate the landlord breached conditions. Thanks for your comment. If you’re not comfortable using pre-authorized debit, then you don’t need to use it. Just out of curiosity though, what’s with the steadfast opposition to PAD? It’s comparable to a post dated check. I’m pretty certain if you articulate your concerns with your landlord reasonably, there won’t be an issue. I have to be honest with you though – you’re sounding kind of combative here. I have MOLD! the land lord is very aware of this. Every time he comes for his rent he states he is working on having it dealt with”always nothing” We live in Nova Scotia, what can be done? Also there was no mention of mold issues by himself or on my lease. I’ve recently moved in a house for less than 6 months on a 1 year lease and now the landlord suddenly try sell the house and offer an apart to me but that’s not what I signed the lease for. What legal rights do I have? Hi Pablo – thanks for your comment. This is a typical question. Out of curiosity – what state or province are you in? You are not obligated to move because the landlord is attempting to sell the house. In most cases, if the landlord requires the building for himself or a member of the family, they are required to give you 90 days – again, in most cases. Also – if the landlord is selling the house to a new owner – they are still required to give you ample notice in the event of a sale for personal use. Could you provide a few more details of the situation? Is there a number I can call on? I am on social assistance my “landlord” is taking the money under a fake name through a fake property management company. When he signed the lease 4 yrs ago, (it’s never been renewed, community services doesn’t seem to care) he used the fake name but I NEVER SIGNED the lease. He’s a slumlord and I haven’t had heat or hot water in a week. What can I do? In a nutshell – this sounds criminal on your landlord’s part. What province or state are you in? I can refer you to the LTB in your region if you let me know. My Landlord bought the house we live in a while back. We never signed a lease with him (just with the old landlord). Our original rent included electricity and heat/hw. The new landlord didn’t give proper notice and made us start paying out own power (but decreased rent 50.00). We never signed a new lease or anything. Not only that the washer is shared with apartment downstairs and its on our power meter. We never agreed to anything in that reference and he told us its only 40 cents a load (not the point) he then took our parking spot way from where we always park and now our vehicle barely fits in the driveway. We have had nothing but problems. We gave 30 days notice as we made it clear that we are no longer comfortable here and he told me it unacceptable. Although he did put up an ad for this place to be available dec 1st and is charging 100.00 more in rent per month. What do we do? We are leaving regardless because of the amount of stress he has put us under and for not doing things right. but he is saying we are responsible for rent until he find a suitable renter??? What do I do???? I have been experiencing respiratory difficulties (wheezing, chest tightness), itchy eyes, congestion and a myriad of other issues while living in my apartment. Have been there for around seven years and have a fairly good relationship with our landlord except he is very lax when it comes to upkeep of his property. There is a lot of evidence indicating mold in the apartment and it has very poor ventilation especially in the winter months. I am getting quite worried about my health but I do like the apartment otherwise. I know I have to confront him regarding this issue however do I have any specific rights regarding this issue. Should I consult someone, do a home mold test etc. Is he legally bound to ensure this is addressed? Who enforces such regulations? I live in Hailfax, Nova Scotia. Thanks for your comment. You have the right to communicate your concerns about mold to your landlord. It doesn’t have to be confrontational. Don’t consider a legal route until you’ve had a productive conversation with him. If he’s defensive and doesn’t take your concerns seriously with investigative action on the issue – then I would consider contacting the Nova Scotia LTB. Let me know how it goes – but you need to chat with him about this. Hi there, I was in a yearly lease (Nova Scotia) with a landlord for almost two years. In August, I had a contractor come in to do a few odd jobs and to investigate what I felt was a mold issue in the unit. I was correct. My son is a cancer patient (lung) cancer. I contacted the landlord and advised him in August that due to my son’s medical issues, I wanted to get out of the lease. Long story short, he agreed to let me out of the lease early and with 30 days notice. The lease would have expired in December. I lost thousands of dollars in furniture and personal items due to the mold but I was willing to let it go if he would let me out of the lease. I did follow up our conversation with an email stating “per our conversation and agreement, I wish to provide you with 30 days notice”. We always communicated via email. He did not respond to the contrary. Here we are in February 6 months later and he sends me an email stating I owe him for October and November’s rent. Do I have a leg to stand on here? We had a verbal agreement and many discussions. I have the contractor’s information clearly in a report that there were mold issues. I wonder if Rob lives in the same building as I do, lol. I am in Halifax also, I have been living in this leaky apt for 2 months and it has leaked in through the windows on 5 occasions. I have kept windows open and a heater going to dry to dry and air it out (the laminate oozes water when you step on it. I have Videos of the water coming in. I removed a piece of baseboard in my bedroom and found black colored mould growing. I waited about a week for someone to come cut it out as promised and then cut part of it out myself. When they finally came to cut it out they only did one place of 3 (that I found by removing baseboard and I certainly didn’t take it all off) they cut out the mouldy drywall and threw it in my bathroom trash can for me to find 2 days later? I am still waiting for them to come cut the rest of the drywall where mould is growing, its been about a month now. They offered to move me to another apt diretly below me yet they kept putting me off on letting me see it despite saying they would. After the tenant moved out I went in on my own (door was unlocked) and I found water damage on the same walls that were damaged in my apt. I could put my finger through the drywall. I have to move out as I have asthma and this is my 2nd apartment in this building and my upcoming move will be my 3rd since Dec 1. The first month Dec was supposed to be free as per a promotion (I was never asked to sign a lease) January they charged me 1/2 rent because of the leaks, but February they requested full rent with the conditions of the apt being unchanged. All of my furniture in the bedrooms has Rubbermaid storage containers under the legs so they don’t get water damaged…I have never been able to enjoy my apt(s) in this building for the 3 months that I have been here. I want to give them only 1/2 month rent for February and tell them to take the security deposit for the other 1/2 and I will pay for a week in March as I plan to move out in a week. Can I do this? Any advice? Thanks for your comment. Have you attempted contacting the Nova Scotia LTB about this? I am a Landlord in Halifax, and I have a question about being able to show my units for re-rental. I used to work under another Manager and that person would tell people that if we couldn’t re-rent for the end of the lease term then we as the Landlord could charge the outgoing tenant with a months’ rent due to the loss of revenue. Now that I am a newbie manager, I want to follow the law, but I can’t find anything that addresses this – right now I have 3 units who are refusing to let me show their units so I can re-rent. Thanks for your comment. You need to contact the Nova Scotia LTB. I have a tenant that lives in my property and gave me a notice three months ago to leave on April 30th(the anniversary date). what is going to happen if she doesn’t leave the property on time? or what can i do? and what further steps i have to take to have her removed from the property? i just want to know how long am i going to be fighting with this. i am in Nova Scotia as well. just rented an apartment in Halifax the first inspection in spring was quick since their was a tenant (during food preparation time). Liked the location and size. Before moving in the super shampooed the rug. days later when I moved in we mentioned that there was asmell (musky) he said it was the wet rug. A month later that smell is there still and as bad as ever. I have cleaned, had an air filter. It smells like mildew old stal musky…Unlike any other apartment or even school dorm (in old building). Super says its an old building, some apts have smell worse and he informed us no circulation in apartment…hum. He says we have option to move in 30 days but he plans to keep $800 (+) rent as a penalty. The super states in an email that the rug is in reasonably good condition and has absorbed food smells over the years. My tenant wont allow us to inspect the apt. We found out we don’t have a key, or the tenant changed the lock. I gave the tenant 7 days to get us a key, he won’t give us a key. He won’t make one (I will pay), he wont give me the key to have it copied. I signed a fixed term lease, not aware a year ago. I asked the landlord if I could go month to month before the new lease was up to be signed and was advised he doesn’t offer monthe to month with, I explained to him I was in the process of being approved for a mortgage, he advised only option would be to find a sub letter when the time came. I’ve been approved and spoke with landlord who told me its my responsibility to find the subletter, as he doesn’t have time, I have 3 months before I would be able to move into a home I choose, but I worry due to the time of year I will have a hard time finding someone for Dec 1st. I have yet to put an offer on a home due to this, is there any way out? I keep being told with a home purchase you can break a lease, is this correct? I wasn’t aware of a fixed term lease until recently and don’t recall being told a year ago that’s all he offered, as even then he knew I would be staying until I could purchase a home but was discussed on more then one occasion without advising when my year was up I had to sign another year. I responded to an ad for an apartment, I went had a look things looked ok so I got an application form. I filled it out and returned it to them on sept 9th, I was hoping to start renting on sept 15th because in the ad they were advertising that Sept month was free, so I wanted to have the time to make the transition smooth to the new place. I said I was wiling to pay the damage deposit on Fri sept 12th so that I start getting everything setup over the weekend. I went in on the friday and payed them my damage deposit expecting to get keys and a lease, but no they were waiting to process my application until I payed the damage deposit. I should have just asked for my money back then but they gave me a receipt for a damage deposit so I decided to give it some time. I didn’t hear from them till a week later when they approved my application and that the lease would start Oct 1st and that if I wanted to move in earlier I can just pay the portion of Sept when I moved in. Needless to say the shiftyness of how they handled my application had changed my mind. I told them I wasn’t interested and I would like my damage deposit back and they are refusing they say my damage deposit is forfeit if I am approved and don’t’ accept the lease. I moved into an older, renovated apt with a year to year lease starting Aug 1st. Shortly after moving in, I’ve discovered the place is full of silverfish, both in the apts and the hallways. I’ve written to the super advising them and asking to have someone clear it up – but no response. I can’t cope with having to ziploc my food and walk around in sneakers. And I certainly can’t have anyone over for visits, I can’t live in an apt that’s infested with bugs, and I obviously can’t sublet to someone else…what are my options. I am wondering what rights do I have as a tenant when my landlord is planning on selling their rental unit? Can I be forced out or be made to pay a higher rental rate? i live in the rual area in the Lunenburg county area and on December 10, 2014 myself and many more people had flooeded basements. I called the landlord and said the basement was flooded she didn’t seem to care at all she told me well its going to have to wait til spring and get it cleaned up I didn’t take that to wellI was lucky on Thursday night it went out but now I have a wet floor it was wet before but now its even more. She thinks she has a palace here she doesn’t it needs a lot of upgrades but she is dumb as post she should be paying me to stay here not pay her for a shack which is VERY cold in the winter time. I asked for a mini spite and she didn’t even know what they were and she sold insurance most of her life so I got one installed anyway so if I ever decide to move its mine and i will leave the hole in the walls and she can fix them which it will never happen. To put this place up to code I figure it would cost about 40,000 to 50,000 and its not worth it in my books. I’ve lived in this apartment for 1+1/2 years, in Halifax, NS. When I viewed the apartment before moving in I asked about mice, all kinds of bugs, and mold. All my questions were answered with negatives. The rent that I signed for was $25 more than the listed price, and since I couldn’t access the listing I could not get the listed price. The laundry dryer doesn’t dry your clothes all the way. They repainted everything in this place before I moved in. Mold. There is black mold growing on the walls, in the closet, the shower, in and around the windows. And grey mold is growing on the bathroom ceiling. This place can’t ventilate well because there are vents but they don’t do anything, the heat doesn’t work that well so I can’t open the window to air out the place when its cold outside. There is also the same grey mold on the ceiling in the laundry room. They told us to “wipe it with some bleach” to get rid of it. It seems like it bubbles through the paint. Mice. After I moving in I started noticing these little green cubes I didn’t know what they were so I just ignored them. Last winter we had two mice, I killed one (by accident). The other one disappeared into the walls. Those green cubes were poison. I got my cat not long after. We haven’t had mice since. It makes sense why everyone else in the building owns a cat. Bugs. Last summer we had a huge ant problem, Carpenter ants and smaller ants. They were all over my apartment and in the stairwells, so I know I wasn’t the only one having this problem. There are also Weeviles (Flour beetles) all throughout the cupboards, all year round. Is my landlord liable for any of these or all these problems? I asked about each of these things, but they haven’t done much in ways of prevention or managing the problem. I have just passed my 1st year in a year to year lease in an apartment building in Dartmouth, NS and I now have a house I wish to purchase. Am I going to lose the house because I have to wait until next January to get out of the lease? Thanks for your comment Wendy. What province or state do you live in? Thanks for your comment. It depends. What province or state do you live in? Thanks for your comment. That was a very detailed overview of the issues you’re having. Yes – your landlord is obligated to fix the issues. Have you contacted the NS RTB? Did you have an agreement with your landlord to allow for a month to month lease post anniversary? I live in Dartmouth NS. The building we live in has not been maintained since we moved in. Every time we ask if someone is coming to clean, we get threats and are harassed with scores of messages. We discovered that we are paying for 6 indoor/ outdoor lights on our power bill. when we tried to speak to landlord about this we were again threatened and barraged with harassing messages, I finally turned the breakers off for these lights on October 1st.2014 our power bill has gone from 41 kil hrs/to 19 kil hrs. The laundry room flooded and he tried to blame us for this, it was underwater for 9 days and as a result there is now black mold all over the walls. the thin plaster in the laundry room also fell off in places which he also tried to blame us for. the tenant who used to live on the top floor moved on Dec 4th 2014 , the property manager came and put at least 50 bags of rotting garbage in the front and back hallways, this is the second time rotting garbage has been left in these hallways for months at a time. therefore we are infested with fruit flies for the second time since our residency, this rotting garbage is still there as I write this( over 2 months now).the washer is also broken at the moment but none of us tenants dare to tell him for fear of the harassment and threats we are sure to receive. the property manager comes to collect the rent early every month and if we do not comply she goes berserk and screams and also threatens us all!because of this we are refusing to deal with her ( property manager) we have asked repeatedly for bank acc info to deposit our rent directly and they have refused, this month our rent was a few days late because we will not open the door to this woman again! we finally got a response to email the rent and are willing to keep doing this. the landlord and property mgr have been telling we tenants that cleaners are coming since the 1st of july 2014, we are still waiting. there is no one to shovel snow either, my son asked about this and once again we were threatened with a 5 day eviction if we didn’t leave him alone At this moment we have literally been trapped in this building by the snow. we were using the back door but he had someone with a plow come to shove all the driveway snow against the back door effectively cutting our only means of safe exit. I am a 57 year old disabled woman and I am at the end of my rope, please give us some advice on what we can do. How often should a landlord paint an unit. I know someone who moved into a unit and the place was not painted before they moved in. Now after 6 years living in the unit the placed really needs painting and the superintendent says that is the responsibility of the tenant while they are living there. So do this mean that if you live in a place for 20 years you cannot get your unit painted until you move out unless the tenant does it themselves at their own expense, that does not sound correct to me..any answers on this one please? You need to contact the Nova Scotia LTB and weigh your options here. Landlords are not obligated to paint a unit unless it’s in disrepair. Is it? What province are you in? Did you sign a year long lease? Hello .. we started renting a house January 3rd , three weeks ago the owner told us he was putting it for sale ; three days ago he told us he has sold it and we have to I’ve out within a week. What should we do?! My husband and I moved into a house on July 1 2016. The owners were moving to their cottage in the country and were doing renovations at their cottage. We had a flood in the basement in the winter and the whole basement had to be ripped apart. New subfloors, drywall and all. We asked our landlord for a deduction on the rent because we had to live in the house with the construction. We also have a new baby so luckily I was off on maternity leave. I was there every day for 4 weeks to let in the workers to do this construction. It was a big head ache because I have a young baby and a big dog who thinks hes a guard dog. Lots of barking and crying . (including me lol) Anyways long story short she gave us 250 off the rent (we pay 1250) . We had also discussed the power bills being affected. When I got my power bill it was 120$ more than the previous one. She only offered 25$ I said I didnt feel that was fair. She said she was dropping off her three months written notice and shes kicking us out. She said her and her husband were moving back in. We are in a period year lease. Also her notice was given on April 4th. April 1 would be 3 months before anual renewal… can she do this???? For personal cheques, the landlord cannot charge me more than what I already gave to them. But PAD, according to the cancellation section on payments.ca, I have to ask the landlord to stop charging me. I have no control over when I can cancel the arrangement nor my bank. What if the landlord refuse to cancel? What if the landlord charge more than the rent and tell me it’s for maintenance of the building or whatnot? The point is, why the heck I wanna give up my control over my bank account to landlords? You have NO legal obligation to pay with pre authorized debit. If the landlord is saying that, they’re wrong. It’s pretty straightforward. Also – I’m not sure what section you’re looking at here on the website, but I just spoke with the fine people at Payments Canada on the phone prior to responding, and they very clearly indicated that there is always a written agreement that exists prior to setting up a PAD. In that written agreement, that is required to be submitted for PAD arrangements, you can clearly indicate that nothing other than the agreed upon amount is charged. You can even specify the days in question that the debit should occur, and work caveats into the agreement that indicate when the PAD should not be debited. The landlord cannot just randomly charge whatever they want one month because they feel like it or consider it justified. Also – you do have a nuclear option on the PAD arrangement with your financial institution. If everything goes south with your landlord in the worst possible way, you CAN cancel the PAD with whoever you bank with, and you certainly have recourse you can follow with the province to get whatever money you feel owed back, if that’s part of the situation. What you’re implying here is that PAD is an option that landlords choose because they can control your bank, screw you over, and get a bit of extra spending money when they see fit. Just another thing the man does to kick it to the little guy. That’s simply not true, and I would suggest you research a bit more thoroughly before coming to a conclusion like this. The reality is the opposite. It’s simply just another arrangement for the process of funds. P.S. I think you’re being more combative than Bella. Hi I’m trying to sublet my place after posting ads and talking with the landlord to get the go ahead she turns around and says no dogs after I’ve made plans with people can she do this ? Of course she can. The pet policy should have been discussed before doing anything. I live in Nova Scotia an have been served with a 15 days eviction notice due to unpaid rent. I haven’t been getting my child tax benefits since July but will receive my back pay in October since by income tax has finally been processed. I can’t get my landlord to stop the eviction process and I doubt I’ll jave the rental arrears with the 15 days. Do you think the board would decide into favor of I file am application for a hearingood? I can’t tell you what the likelihood is, as I’m sure I’m not getting all the facts and pertinent elements of the situation (i.e. how much rent is in arrears, if this is a pattern or a one off situation, is the landlord is not doing something correctly etc). They may or they may not, however, the fact remains that the rent is not being paid – so that won’t reflect well on you. Good luck. I am being harassed by my landlord, superintendent, and a large group of people in my current building; they are all family/close friends; in a small village I just moved to four months ago. My landlord demands I let them in on Sunday; to show the place; as I gave my notice to leave; and ask him not tell anyone, for fear of further harassment; he told them; and the harassment has increased. A couple months ago while I was away for Christmas, one of the tenants broke into my apartment and stole a knife from me. Do I have the right to refuse them showing the place? He can easily wait the few days until I am gone; and I feel he is showing it while I am here to increase the harassment and my stress levels. They know I am bipolar, and since they found that out; have been attacking me in a wide variety of ways; the landlord has ignored all my complaints about these actions. Hi Steve. The landlord has the right to show the unit with appropriate notice. If you have an issue beyond that – contact the NS LTB.